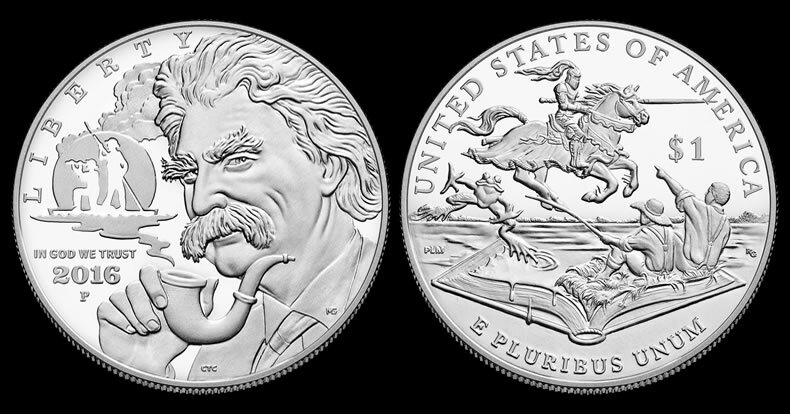 United States Mint pricing has been unveiled for the upcoming 2016 commemorative coins. The information comes from U.S. Mint documents dated Dec. 15, 2015 that are set to become public later today in the Federal Register, the official source of notices by government agencies and a daily journal of their proceedings. Before getting into their actual prices, keep in mind that they’re already higher than they would be because of Congressional mandated surcharges of $35 for each gold coin, $10 for each silver dollar and $5 for each clad half-dollar. Prices climbed for the 2016 clad half-dollars, up $7 compared to the 2015 editions. New silver dollar pricing is down $1. That’s a plus, but it also doesn’t fully compensate for how much silver has fallen. Silver dollar melt values have actually declined about $2.80 from back when a notice revealed prices of the early 2015 commemoratives. The public notice outlines the following introductory and regular prices. Pricing for the gold coins will not be known until shortly before they’re released. The U.S. Mint will establish those based on an average of LBMA gold prices. Laws authorizing commemorative coins almost always limit their sales to the calendar year of their issue. 2015 March of Dimes Silver Dollars and U.S. Marshals Service Commemorative Coins will no longer be available after Dec. 30, 2015. To order, visit: catalog.usmint.gov/coins/commemoratives. Thank you for the update. Wow some kind of price gouging going on, especially with the clads … which I don’t normally collect thank goodness. With quality control at an all time low and variety being very lackluster you would think the mint would be trying to bring in new customers not alienate them. I have all but lost faith in the mint to be honest. I have been trying to get my daughter interested in coin collecting but once you have seen one eagle, you have seen them all. They need to turn this sinking ship away from the iceberg or a lot of people will go back to collecting 60’s and 70’s coins that are affordable rather then buying “mint” coins. Just sayin’. All – I can’t say it any better. I too am becoming very tired of pedestrian designs and prices that seem to have come uncoupled from the precious-metals market. The NPS set is only major one on my list for next year, and that’s because it’s a gift for my daughter who works for them. It seems the only way for a new mint director is that one political party wins across the board. Have you asked U.S. Mint officials to explain why they raised the price of the 2016 NPS clad half dollar commemoratives by a huge amount of $7 from this year’s clad U.S. Marshal half dollars? What is their lame excuse this time officially? Can you please use your inside contacts with Michael White & Tom Jurkowsky & Lateefah Simms or other contacts & let your readers know about this important issue? Thank you.Mr. Unser! As I’ve mentioned multiple times before, silver has never been included in the pricing grid because that is where all the sins of the mint are hidden. Now they have obviously added clad coins to the sinners bank account. I admit clad coins and silver as well are below the pain threshold of the high salaried government bureaucrats that control the mint and it’s processes but with the no cost to taxpayers rule the mint has to hide their shame of mistakes and screw-ups somewhere. Don’t forget as stated in every press release the mint’s responsibility is to “produce circulating coinage for the Nation to conduct its trade and commerce”. Providing specialty coins for collectors and investors certainly wasn’t in anybody’s mind back in 1792. Because gold and platinum coins are tied to the going price for those metals the silver and clad coins have to pay. No not a CPA and retired, not looking for work. The benefits of working for a not for profit organization. If the mint were a corporation anything an employee did with company resources would belong to the company unless it was totally non-competitive like writing a book. I think most of us were complaining about the quality of products not so much the price. And again they’ve shown that their quality is deteriorating day by day, they can’t even released the same series of coins on the same day anymore. They need a change in leadership that is all it is to it.